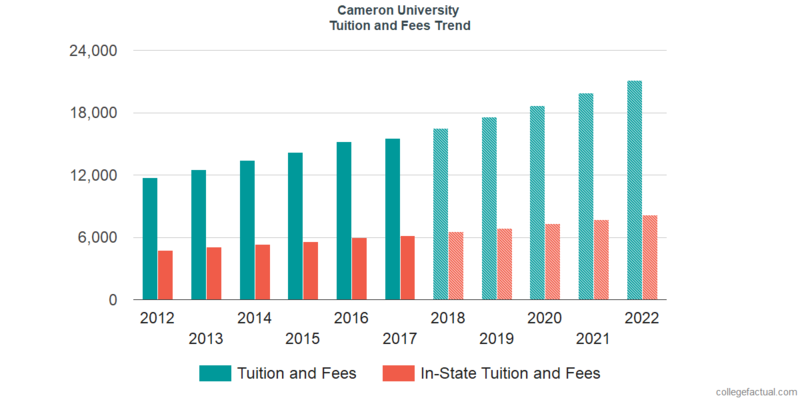 Review present and expected tuition and fees for Cameron University, in addition to how these prices compare to nationwide and regional averages. Plan economically for your degree. Compare Cameron University's fees and tuition to other American colleges and universities. Check for price developments and potential increases to see if you should budget for more funds for the next four years of paying for college. The subsequent table outlines how Cameron University measures up to other schools nationally, regionally and by state. Cameron University tuition and fees is lowered dramatically for students from Oklahoma. For in-state students, tuition and fees is set at $6,180 for the 2017 - 2018 year, 60.2% off the price charged to out-of-state students. Tuition is $4,470 and fees $1,710. Cameron University out-of-state students paid $15,510 in fees and tuition in 2017 - 2018. $1,710 was for fees, and $13,800 was charged for tuition. See Cameron University cost per credit hour here. Tuition and Fees for out-of-state students attending Cameron University grew with a typical yearly rate of 6.4% within the last 5 years. In the same time period, tuition grew by 6.9% and fees grew by 0.0%. Based on this, we estimate the cost of tuition and fees this year will total $16,501. For a two-year degree, we estimate tuition and fees will be $34,057 and $72,605 for a four-year degree. This does not cover additional charges for example room and board, books, and transportation. View what future tuition and fees will be for Cameron University students including residency based discounts in the below chart. Be aware of how much college fees and tuition is growing annually. At most schools students will end up spending more money on their final year of college than they did for their first.